How Do I Get to Paris from Charles de Gaulle or Orly Airport? Paris has an excellent public transportation system, and this includes shuttling passengers efficiently and relatively inexpensively from the main airports to the city center. Well-armed with information on connecting from your terminal to ground transport, you shouldn't have any trouble getting from the airport to the city. You can get to Paris from the main international airport, Roissy/Charles de Gaulle, by suburban train (RER), bus, shuttle, or taxi. The RER Line B (suburban train) departs every 15 minutes from terminals 1 & 2 and arrives in central Paris within 30 minutes. The trains run from 5 a.m.-12:15 a.m. At 8.40 Euros, this is the cheapest option, but is less practical if you have a lot of luggage. From Terminal 1 , take a line 2 Aeroport de Paris shuttle bus (free) departing from gate 22. Get off at Roissypole-Terminal 3 and follow the signs to the RER. Roissybus is an express bus service that departs every 15 minutes, 6:00 a.m.-11:00 p.m., from Charles de Gaulle airport terminals 1,2, and 3 and arrives an hour later near metro station Opera in the 9th arrondissement. A one-way ticket costs 8.90 Euros. Follow the signs to "Roissybus" and purchase a ticket from an RATP vendor near the gate before boarding. The bus is equipped with space for luggage. Roissypole bus lines 350 and 351 leave from Charles de Gaulle terminals 1 and 2. Bus # 350 goes to Gare de l'Est in northeastern Paris. Line 351 goes to the Nation metro station in the southeast. From terminals 1 or 2, follow the signs to ground transport. From terminal 3, take a free airport shuttle to terminals 1 or 2. Air France operates two shuttles "Le Bus Direct" that leave from Charles de Gaulle terminal 2 every 15 minutes and serve 5 stops in Paris. Follow the signs to "Le Bus Direct" at terminal 2, or take a free shuttle to terminal 2. The first shuttle runs from 5:45 a.m. to 11:00 p.m. and stops at Etoile (on the Champs-Elysées, 1 Avenue Carnot)and Porte Maillot (Blvd. Gouvion St. Cyr), both in Western Paris. The trip takes about 35 minutes. The second shuttle runs from 6:00 a.m. to 9:00 p.m. and stops at Gare de Lyon and Montparnasse in Paris. The trip takes 50 minutes. For current prices, see the official website . Taxis can be easily found outside each terminal at Charles de Gaulle. On average, fares to central Paris cost 40 Euros. The RER B (suburban train) connects to Orly airport via the Orlyval airport train. Follow the signs from Orly Ouest or Orly Sud to "Orlyval", then from the Antony train station, connect to the RER B, direction Paris. If need be, you can then connect to the Paris metro at stations Denfert Rochereau, Saint-Michel, Chatelet-les-Halles, or Gare du Nord. Departs: every 7-10 minutes, from 6:00 a.m. to 11:00 p.m. 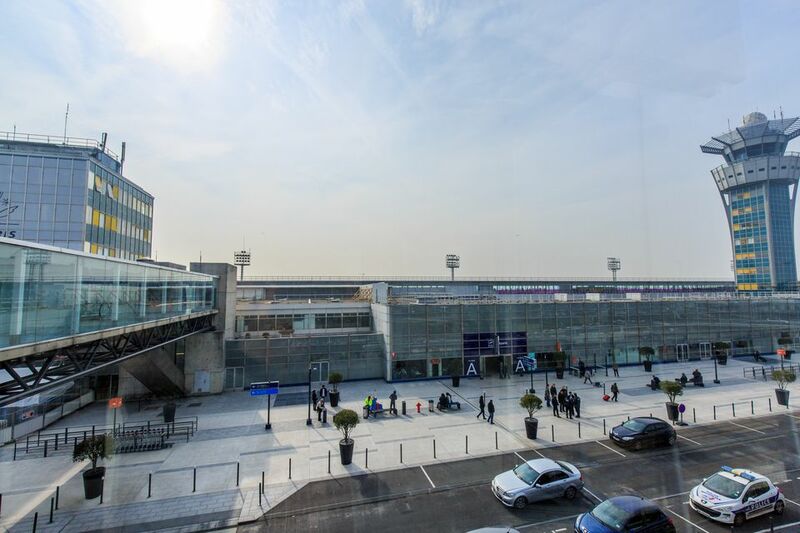 The RER C (suburban train) connects to Orly Airport via shuttles that leave from the Porte de Rungis station. From the airport, take a shuttle to Porte de Rungis, then the RER C to Paris. Departs: Shuttles for Porte de Rungis leave every 15 minutes, 5:45 a.m.- 11:15 p.m., from gate G- quai 1 at Orly Sud and from the arrival level at Orly Ouest. The Orlybus is a direct bus run by the RATP (metro) connecting Orly Airport to Denfert Rochereau in southern Paris. Departs: Every 15 minutes, 5:35 a.m. to 11:00 p.m. from Orly Sud and Orly Ouest. Trip takes about 25 minutes. Air France shuttles depart from Orly Ouest and Orly Sud and stop at metro stations Porte d'Orleans, Montparnasse, and Invalides. Departs: Every 15 minutes, from 6:00 a.m. to 11:30 p.m.
Taxis depart regularly from Orly Sud and Orly Ouest. the average fare to Paris is 20-30 Euros.